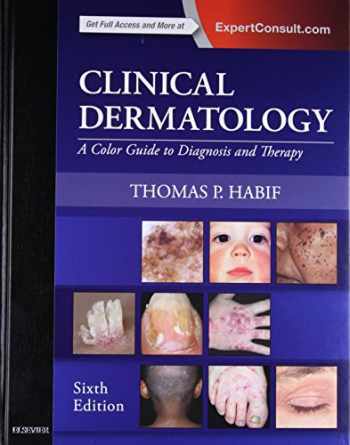 Acknowledged author Thomas P. Habif MD wrote Clinical Dermatology: A Color Guide to Diagnosis and Therapy, 6e comprising 1064 pages back in 2015. Textbook and etextbook are published under ISBN 0323261833 and 9780323261838. Since then Clinical Dermatology: A Color Guide to Diagnosis and Therapy, 6e textbook received total rating of 4 stars and was available to sell back to BooksRun online for the top buyback price of $59.38 or rent at the marketplace. Identify, treat, and manage the full range of skin diseases with guidance from Clinical Dermatology: A Color Guide to Diagnosis and Therapy the worlds leading dermatology manual. Clean formatting, easy indexing, and exceptional color images make this an indispensable source for definitive, state-of-the-art answers on every aspect of dermatologic care. "…an excellent one stop, single volume resource which doubles as a combined atlas and textbook of general dermatology." Reviewed by glycosmedia.com, Sept 2015Gain reliable, practical, and efficient guidance regarding the diagnoses and treatment of every dermatologic disorder you are likely to encounter. View the likeliest differential diagnoses for any body region with an updated DDx Mannequin online. Diagnose and treat diverse patient populations with expanded coverage of patients with skin of color. Treat patients who have been traveling abroad with new coverage of tropical diseases. Expert Consult eBook version included with purchase. This enhanced eBook experience allows you to search all of the text, images, dermatologic formulary, Differential Diagnosis (DDx) Mannequin, and much more from the book on a variety of devices. Make rapid, confident decisions on diagnosis and treatment by comparing your clinical findings to over 1,000 of the highest quality color images―including hundreds of original, never-before-published photographs―depicting virtually any skin condition. Apply the newest developments in diagnosis and treatment thanks to thorough updates throughout including an extensive section on the management of acne, eczema, and psoriasis as well as expanded coverage of arthropod disease. Prescribe effective dermatologic treatment with an expanded formulary to the most commonly used drugs; detailed guidance on the use of antibiotics; and the inclusion of the latest drug treatment options. Quickly access vital, up-to-date information from new tables throughout summarizing "need to know" diagnostic and therapeutic evidence.